10/26/2009Share this story on Facebook! Top Girls is just the first main stage play this season. 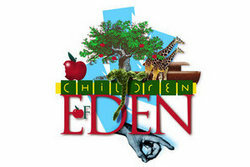 Be sure to get tickets ahead of time for Children of Eden in November and Eurydice in early December. The bachelor of fine arts degree in theatrical production arts is an intensive, undergraduate, preprofessional degree that emphasizes practical theater training and its place in the liberal arts. 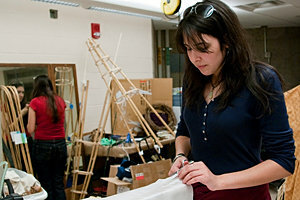 You'll sharpen your skills by selecting one of two concentrations: theater technology or theatrical design. “Being in the [theater arts] program is what it must be like to have spiritual faith,” says Madison Ryckman, ’11, costume designer for Top Girls, Ithaca College’s first main stage production of the season. Faith might be a good descriptor for the small family of theater students, who must rely on each other to transform each written play into an actual performance. “We choose our season as a vehicle for training our student actors and designers,” says Norman Johnson, an associate professor in the theatre arts department and the director of Top Girls, a play by Obie Award-winner Caryl Churchill. 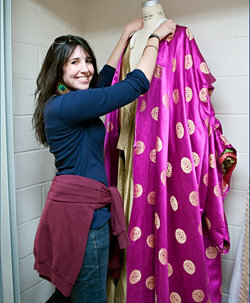 Each Ithaca College production is designed entirely by students with the help of faculty mentors. “One has to take it from the page and make it stand up,” says Johnson. That process began months ago as Ryckman and student lighting and scenic designers joined a student technical director to research the play and share ideas about what the final product might look like. For the play's complicated portrayal of successful women, Ryckman drew on works by feminist artists such as Georgia O’Keefe and Judy Chicago. The designers and director collaborated to create the first round of renderings, literally crafting a vision for the performance.